Jaigarh fort is one of the famous tourist spots of Jaipur, Rajasthan. The fort was built by Raja Sawai Jai Singh II in the year 1726.. The structure of this fort is nearly similar to the Amber fort which was built by Raja Man Singh I. This fort is also known as ‘ The Victory Fort’. This fort is located on Aravalli ranges of hills and situated at a height of approximately 550 feet on the top of the hill. We can see the excellent view of Amber fort from here. Today Government of Rajasthan is looking after this fort. Red color marble stones are used for construction of this fort. The world’s largest cannon is placed in this fort. 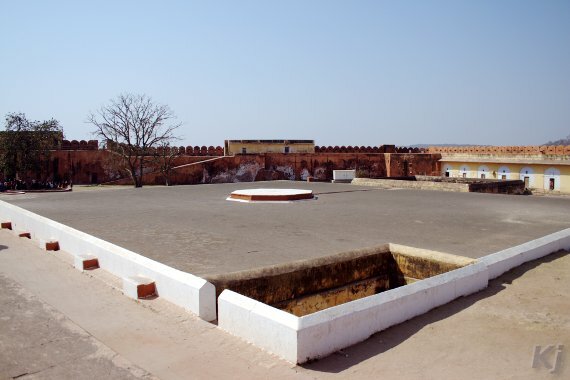 This fort was the center of artillery production of Rajputs earlier. Pucca canals which are located on the surrounding hills brought rain water to those. Emergency requirements are fulfilled by these tanks. Out of these the largest tank is 158 feet long, 138 feet wide and 40 feet deep; water is stored in this tank which has a capacity of 60 lakhs gallon. The height of this canon is 5 km . By creating water harvesting structures, the water supply facilities in the fort was done n the Aravalli and conveying water through a canal on the west side of the fort which is located over a height 4 kilometres distance to be stored in three underground tanks below the central courtyard. Out of which one tank was used by prisoners for bathing, the second was used to store gold and jewellery and the third one was empty. These tanks also created a stir in the recent political history of the fort when they were searched for hidden treasure stashed for gemstones and jewellery of their Royal relatives which turned out is untrue. A water tank is located here which is linked to the canal. It is said that the kings of Amber or Jaipur used the compartments which are located below these water tanks to keep the gold and jewellery of their Royal relatives. This tank was opened once when Prime Minister Indira Gandhi said to open this during 1975-1977. A 69 feet in length , 52 feet wide and 52 feet deep tank is located just behind the large tank and one room is also made under each hole. The treasury by the Rajas is also stored in these rooms under the rule of Raja Sawai Jai Singh. He used that money in founding the Jaipur City. The garden and the Aram Mandir in the courtyard , on the northern side of the fort , has a triple entrance and known as “The Awani Darwaza” which has now joined with Sagar lake , so water from this lake is used to be transported to the fort. Pucca canals which are situated on the hills are responsible for bringing the rain water to these tanks. The tank water in the fort was stored for emergency; generally the water was taken from the water tanks which are located below the hills on Amber side.